A great recent find to kick off my hypothetical $1 VHS Film Festival, as over the summer I’ll be going through the stack of videotapes that I’ve picked up for short money at various library book sales and thrift stores over the last couple of years. Although clips from the Pythons’ celebrated four-night stand at the iconic venue in 1980 have shown up in compilations, documentaries and online, the full 78-minute film (briefly released theatrically in ’82) has had a history on home video that has been sketchy at best, no pun intended. 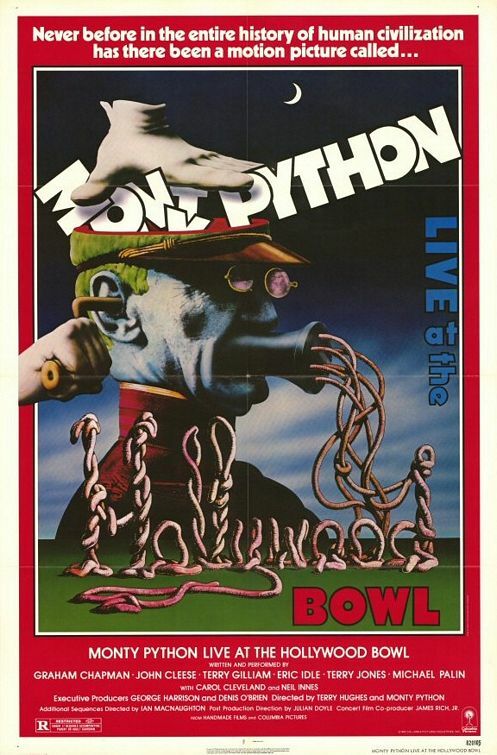 Live at the Hollywood Bowl was a treat to watch all the way through for the first time, to get a fuller sense of the event that was the visceral highpoint of Monty Python’s popularity in the States. The troupe was met with rock-star adoration by the extremely enthusiastic southern California audience and many fans dressed the part as well—lots of them are seen sporting the handkerchief headgear of the show’s dim-witted Gumby men and one is even done up as the Pantomime Princess Margaret. A pensive Python group shot from back in the salad days (no, not the one directed by Sam Peckinpah). 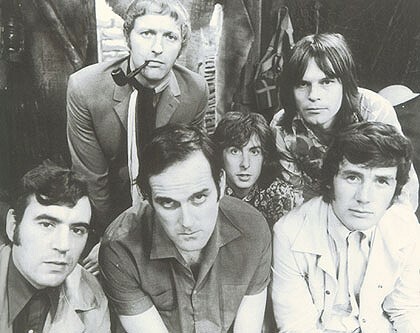 From left, Terry Jones, the late Graham Chapman and his famous pipe, John Cleese, a squished-in Eric Idle, Terry Gilliam and Michael Palin. Another plus is that they had released a few records since the TV show had ended in 1974 so there was material that was new to me or that was only vaguely familiar. Sure, you get your Silly Walks, your Argument Clinic and your Lumberjack Song. But they also perform a pair of naughty tunes from their then-current Contractual Obligation Album (“Never Be Rude to an Arab” and “Sit on My Face”) and skits where John Cleese’s pope chastises Eric Idle’s Michelangelo for a muck-up on The Last Supper (he’s painted twenty-eight disciples, three Christs and a kangaroo) and that great bit where self-made millionaires sit around with cigars and champagne trying to outdo each other on who had the toughest upbringing (“A cardboard box? You were lucky; we lived in a rolled-up newspaper inside a septic tank”). There are also several fun segments where the group takes their act out into the audience, as when Cleese’s roving waitress tries to peddle seabird-flavored snacks during intermission. Considering Python’s enduring popularity, maybe this concert flick will eventually get a proper release for the digital age. Does anyone out there have a copy of the short-released DVD “Live at Hollywood Bowl and Aspen”? That may be the original film plus some extra bits from the same era, because after 1980 the guys (which here also included Carol Cleveland and Neil Innes) wouldn’t get together for a proper string of live shows until (wait for it)… next month! Their recently announced ten-night run of shows coming up in July at London’s O2 Arena will be the last time the legendary troupe will perform together (according to themselves) before they all eventually “bring down the curtain and join the Choir Invisible.” A live simulcast in over two thousand movie theaters worldwide is planned for the last of these ten shows, scheduled for July 20th. Keep a look out for details, sounds like a must-see event for us diehards.